I can not tell a lie. I ate the entire bowl in five minutes flat. This is the kind of thing that happens when you make a pan of gloriously roasted mushrooms in the middle of the day when no one else is home. Typically I would serve these as a side dish, or even an appetizer. Come to think of it, they would be fantastic in a salad or mixed into a pasta dish with some rotisserie chicken and Parmesan cheese. Now I’m hungry again. When I first made these roasted mushrooms with rosemary, I mixed in the garlic at the beginning (as you see in the picture above). However, I found that the garlic was burned by the time the mushrooms had reached their tender, golden brown perfection. So, the next time I added the garlic partway through cooking. This still gives the garlic enough time to cook and lose its astringent raw flavor, but stops it from burning and turning bitter. 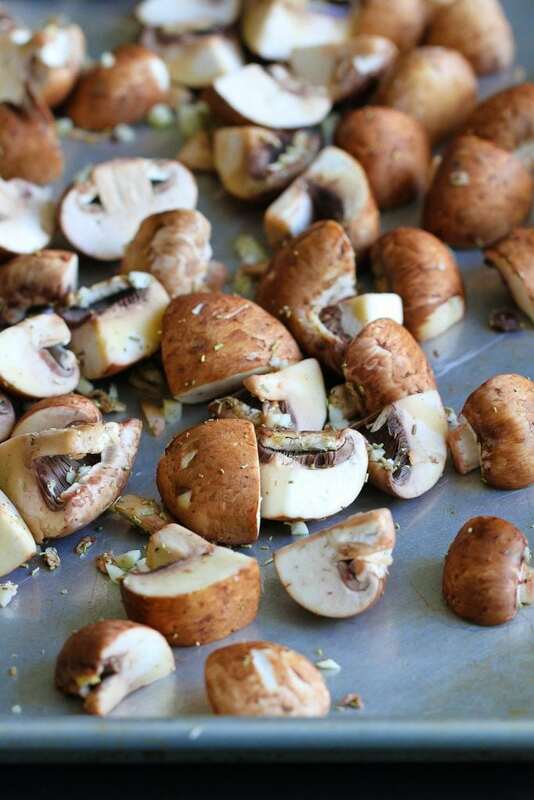 To make sure that the mushrooms roast evenly, cut them so that the pieces are approximately the same size. For larger crimini mushrooms, you may need to half or quarter them. Small mushrooms can be left “as is”. This method would work with a variety of mushrooms. 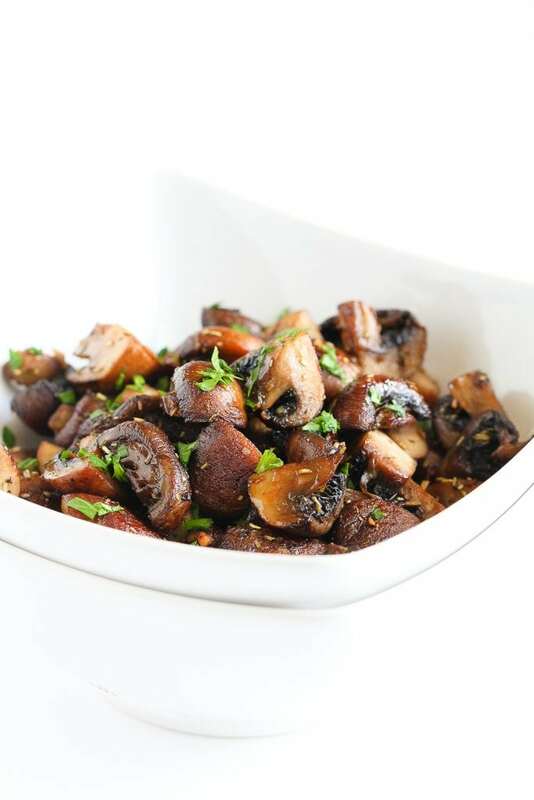 If you don’t have crimini mushrooms on hand, button, portobello or shiitake mushrooms are good substitutes. For larger mushrooms, cut into bite-sized pieces. If you want to use fresh rosemary, by all means do so. Just make sure you increase the amount, as fresh herbs aren’t as strong as dried ones. In this case, I would use 1 tablespoon of fresh rosemary. Depending on the size of the mushrooms, cut them. Cut large mushrooms into quarters, medium mushrooms in half and leave small mushrooms whole. 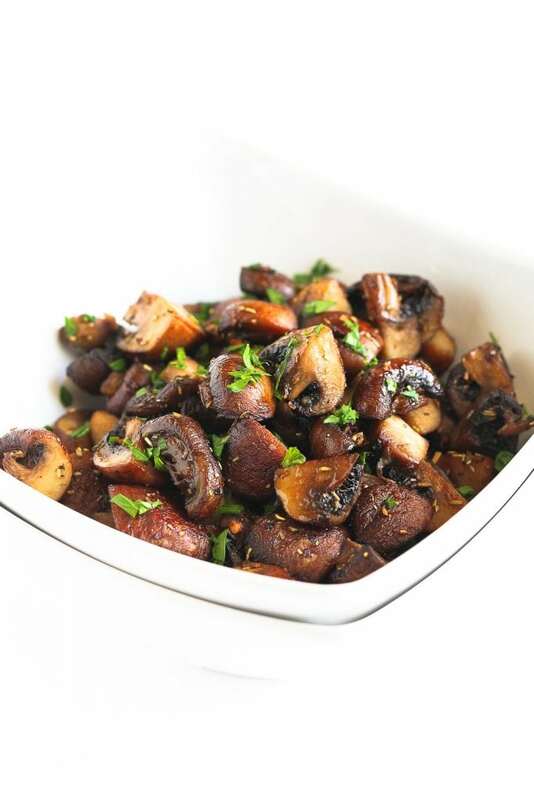 In a bowl, toss the mushrooms with olive oil, rosemary, salt and pepper. Transfer to the prepared baking sheet. Roast the mushrooms for 10 minutes. Add the garlic and stir to combine. Roast until the mushrooms are tender and starting to brown, 7 to 10 minutes. Serve. This recipe was originally posted on September 15, 2014, and has been updated. I would be right next to you, fighting over the pan. I LOVE mushrooms, especially roasted. This is absolute perfection. My husband loves rosemary and mushrooms – I will be making these for him soon. And I will be doubling it because I would also eat the whole bowl! I could eat mushrooms like this all day every day! This looks so good, Dara! This would make a perfect appetizer at a party (using toothpicks), or as a dinner starter on a bed of spinach – that assumes there is any left by then. Sounds glorious, Dara. You might consider these a side but I’m thinking main course. These, a bit of pasta and some Parmesan and I’m good! I’d totally eat this entire bowl in 5 minutes flat too. Guess what I’m making for lunch this week? Pinning! These look delicious! maybe with some steak!? I don’t blame you! I would eat the whole bowl too! LOVE roasted mushrooms! Pinned! I am right there with you – I would have totally eaten the whole batch of these myself! I would probably eat the entire bowl myself. So delicious. 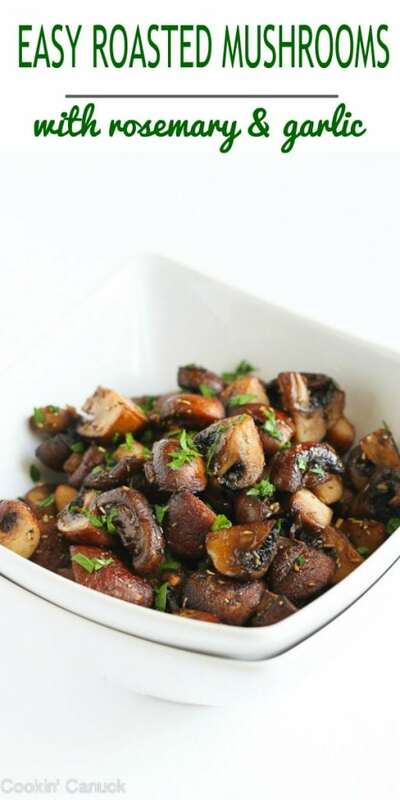 One of the best smells on the planet is mushrooms being sauteed! Might try this with some pasta, like you suggest! These look sensational! I definitely would have eaten the entire bowl, too! But then, I would’ve had to have made a whole second batch when my kiddos arrived home, since my little son loves mushrooms at least as much as I do! 😀 Rosemary is hands-down my favorite spice to use when roasting veggies! Pinning – can’t wait to try this (and maybe share some with my son, too!). I just love mushrooms, and your picture has me drooling! I’m going to try this but by throwing in the whole cloves of garlic instead of chopping first. I’ll also be adding them to caramelized cipollini onions and asparagus. Trying these for the first time tonight with of course Ribeye. Hope the husband likes em. Mushrooms with Garlic are the best combination ever! Thank you for sharing such a lovely recipe. I could eat the whole bowl of these! Use the roasted mushrooms in place of freah or canned in soups, casseroles, or on pizza and they keep a meaty texture instead of getting soggy.